UPDATED: Prime Minister Erna Solberg wants Norway to contribute to a new EU agreement on how the ongoing stream of refugees and migrants to Europe will be handled. The Liberal Party, which is now part of Solberg’s conservative coalition government, thinks Norway should also take in 5,000 refugees registered through the UN, while the government’s only concrete offer is to take in 15 of those on board the migrant ship Lifeline. The new EU agreement, hammered out during a dramatic EU summit in Brussels, aims mostly to relieve the burden on countries like Greece, Italy, Malta and Spain. Their sheer geographic location makes them the entry points for the boatloads of desperate people crossing the Mediterranean from North Africa. After more than 13 hours of difficult negotiations among the leaders of EU member countries, all 28 finally agreed that the EU will tackle the influx of migrants and refugees together. Participation will be voluntary, however, on the demands of several Eastern European countries that have objected to taking in migrants and refugees, even though they generated thousands of refugees themselves while members of the former Soviet bloc. Many residents of Hungary and the former Czechoslovakia, for example, fled their homelands during the Soviet era and were taken in by other countries including Norway. They have not felt an obligation to do the same, or to relieve the pressure on fellow EU members like Italy. 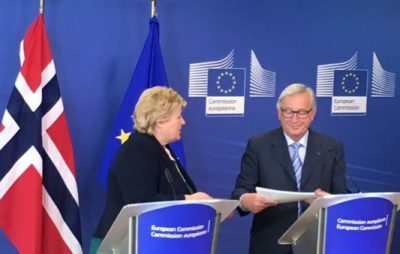 Solberg, who was in Brussels on Thursday, told Norwegian Broadcasting (NRK) that her government is prepared to be part in the new agreement, either by taking in some of the migrants and refugees or by helping to finance new so-called “control centers” to be set up in EU countries along the Mediterranean and possibly the North African coasts. That’s where boat refugees will be taken for an initial screening of their applications for asylum before being sent on to other EU countries while their applications are processed. Austria was particularly in favour of the plan to set up reception and control centers outside the EU for the first time. While Norway is not a member of the EU, it is a member of the European Free Trade Association and pays hundreds of millions of kroner in annual financial aid to the EU in return for full access to the EU’s inner market. Norway is also a member of the Schengen area within the EU and is expected to abide by EU regulations and directives. Back home in Norway, Solberg and her Conservative Party face both demands for strict immigration policy and calls for Norway to take in more refugees from within her own government. The Progress Party, which has shared government power with the Conservatives since they won the national election in 2013 and were re-elected in 2017, has long been skeptical towards immigration, while the Liberal Party, which joined Solberg’s government in January, wants more liberal immigration policy. So do members of other parties that make up the opposition in Norway’s Parliament. After scrambling to accommodate the 30,000 refugees and migrants who arrived on their own in Norway during the influx of 2015, Norway clamped down, has deported many and only accepted around 3,000 refugees in 2016 and 2017. A wealthy country like Norway, which also built up an apparatus to house and process refugees during the 2015 influx that’s since been mostly dismantled, is widely expected to take in far more refugees than what’s approved today. The UN asked Norway last fall to accept 5,000 a year. Solberg’s state budget only provided for 1,120. That number was boosted to 2,120 after demands from the Liberals and the Christian Democrats, without whom the entire budget would not have had support in Parliament. Meanwhile the migrant crisis in the Mediterannean, where boatloads of desperate people are trying to cross to Europe every day, flared up again as soon as summer weather set in. The Lifeline ship, with 234 migrants on board, finally was allowed to dock in Malta this week although Malta, Italy, Spain and other countries lying closest to the North African mainland already have taken in hundreds of thousands in recent years. With Italy’s new government claiming to be well beyond saturation point, and refusing to accept more until other EU countries accept their share, the EU was under huge pressure to hammer out the agreement on migrant arrivals. Norwegian Foreign Minister Ine Eriksen Søreide issued a press release on Thursday stating that “in light of the difficult humanitarian situation, and in solidarity with European partners, Norway will aid Malta.” Norway is thus now one of several European countries that have agreed to take in some of those stranded on the Lifeline. Offering accommodation to 15 people won’t help the roughly 600,000 currently languishing in Italy. Solberg now seems willing to take in more, not least to help save German Chancellor Angela Merkel from seeing her own government fall over the migrant crisis. Solberg told NRK that would be “a great loss” for Germany and for Europe. Merkel has pushed for distribution of refugees and migrants among all the EU member nations, but has met firm opposition from countries like Hungary and Poland that have accepted EU aid (also from Norway) since joining the EU after the Soviet Union fell apart but that now won’t accept the responsibilities that come with EU membership. Many, including a Norwegian professor as late as Thursday, have claimed their financial assistance from the EU should be cut off in return. That’s an issue still to be hashed out in Brussels, where EU members also have disagreed on where and how many migrants should be placed in EU countries while their applications for asylum are processed. Norway, through it’s own large funding to the EU, may also be in a position to pressure the reluctant Eastern European countries to take in more refugees even though that will be voluntary. “We built our own asylum policies in fellowship with the EU,” Solberg told NRK. She stressed the importance of the EU’s so-called “Dublin agreement,” though, which allows countries to return migrants and refugees to the country were they arrived for processing of their applications for residence. That’s Italy in many cases, which is overwhelmed and demanding its hundreds of thousands be sent out as well. Details were still being hashed out, but the new “control centers” may dilute some of the Dublin agreement’s effect. Asked how many refugees and migrants Norway could take in, Solberg claimed “we have no number for that.” She noted that the EU was working hard to find solutions: “The problem is that everyone has to contribute, and there are some countries where leaders have conducted election campaigns based on not doing that.” Now they may not “have” to contribute, but will likely be encouraged to do so. Solberg has also said Norway would contribute to the proposed establishment of reception centers for migrants and refugees in North Africa and possibly even Albania. Several countries in North Africa have already objected to the plan, though, while the costs, construction and question of whether migrants already in Europe could be sent to the centers are still being debated.